Throughout their career, Dream Theater's live shows have gradually become bigger, longer, and more diverse. The most obvious example of this is their rotational set list policy. That is, every single night of every tour has its set list devised by Portnoy using a meticulous process that ensures its uniqueness. Factors such as set lists from previous cities are taken into account to ensure that people who see Dream Theater multiple times within the same area will not see the same songs performed twice, and even the set list from the last time the band was in a particular city is taken into account for the benefit of fans who see the band on successive tours. For this to be possible, the band prepares to play the majority of its catalogue at any performance, depending on what Portnoy decides to program for that night. This process also requires the employment of a complex lighting system to load pre-configured lighting cues based on the individual songs. Some of Dream Theater's more notable touring partners include Deep Purple, Emerson, Lake & Palmer, Iron Maiden, Joe Satriani, King's X, Marillion, Megadeth, In Flames, Pain of Salvation, Porcupine Tree, Opeth, Queensrÿche, Riverside, Spock's Beard, Fear Factory, Enchant, Symphony X, and Yes. In 2005, Dream Theater toured North America with the Gigantour festival, co-headlining with Megadeth, and have played with Megadeth and Iron Maiden physically on stage. The band's full world tours, since Six Degrees of Inner Turbulence, have predominantly been so-called "Evening with..." tours, in which the band performs for at least three hours with an intermission and no opening act. The show that was recorded for Live Scenes From New York was nearly four hours in length, and resulted in Portnoy almost being hospitalized after acquiring severe food poisoning from the food he ate before the show. There is also a significant amount of humor, casualness, and improvisation attached to a Dream Theater concert. 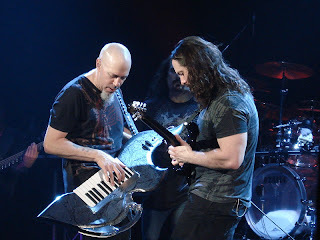 In the midst of "A Change of Seasons" it is quite common for themes such as those for Major League Baseball and The Simpsons to be quoted, and Rudess routinely modifies his solo section in the song and others, often playing the ragtime section of "When the Water Breaks" from Liquid Tension Experiment 2. Several songs included on Once in a LIVETime include snippets of others' pieces, such as Lynyrd Skynyrd's "Free Bird" and Rimsky-Korsakov's "Flight of the Bumblebee." Other quotations include "Mary Had a Little Lamb" during "Endless Sacrifice" on the Gigantour, a calliope-inspired break between verses of "Under a Glass Moon", a quote of "Don't Cry for Me, Argentina"'s main melody played by Petrucci while performing the intro solo of "Through Her Eyes" in Buenos Aires, the Turkish March at a concert in Istanbul, and the opening riff of Rush's "A Passage to Bangkok" at a show in Bangkok, Thailand. On the most recent "20th Anniversary World Tour" Rudess has even thrown in a short "Twinkle, Twinkle, Little Star" theme in a break during "Endless Sacrifice", and during a concert in Israel he started a spontaneous "Hava-Nagilla" later accompanied by the rest of the band. Occasionally, a member of the audience is picked at random to perform on stage, an example of which can be seen during Portnoy's drum solo on the Live at Budokan DVD. There have also been many impromptu renditions of "Happy Birthday" when a member of the band or crew has a birthday corresponding to a tour date, which normally results in a birthday cake being thrown at the subject. Perhaps the best example of Dream Theater's unpredictable concert structure is that during Derek Sherinian's time with the band. At selected shows the band members all swapped instruments and performed an encore as the fictitious band dubbed Nightmare Cinema. They usually performed a cover of Deep Purple's "Perfect Strangers", and, on one occasion, Ozzy Osbourne's "Suicide Solution". At some shows, Sherinian, Petrucci and Portnoy would take the stage together under the name "Nicky Lemons and the Migraine Brothers". Sherinian, wearing a feather boa and novelty sunglasses, would perform a pop-punk song entitled "I Don't Like You" with Petrucci and Portnoy backing. In Chaos in Motion tour, in several concerts before "Trial of Tears", Portnoy and Petrucci would change positions and play Van Halen's "Eruption". Dream Theater's largest audience as a headlining act was 20,000 in Santiago, Chile on December 6, 2005. This was during their first tour of South American countries other than Brazil (which they had visited in 1997 and 1998). The show was released on DVD through Portnoy's YtseJam Records. In the Score and Chaos in Motion DVDs, an animation has accompanied certain parts of the songs, showing the band playing along to the music as cartoon characters. On the Score DVD, during the song Octavarium, the band is seen performing in an octagonal shaped maze. As the animation continues Jordan Rudess spontaneously turns into Santa Claus and John Petrucci catches fire. In "The Dark Eternal Night" from the Chaos in Motion DVD, the band battles against a monster by shooting fireballs from guitars, throwing drum sticks, and screaming. In 2008 Dream Theater started the "Progressive Nation '08" tour, along with Opeth, Between the Buried and Me, and 3. The tour is the brainchild of Mike Portnoy, who stated, "I've been wanting to assemble a package tour like this for many years now. With all of the festivals and package tours that go through America, I've been talking with our manager and agent for over 10 years now about doing something that focuses on the more progressive, musician-oriented side of hard rock and metal. I decided it was time to stop talking the talk, lace up and finally walk the walk." On February 13, 2009, Dream Theater announced the official line up for their Progressive Nation 2009 tour. The tour was originally set to feature bands including Swedish bands Beardfish and Pain of Salvation, as well as Zappa plays Zappa. On June 22, 2009, Mike Portnoy announced that Pain of Salvation and Beardfish would not be touring the North American leg of the Progressive Nation 2009 tour due to record label complications. In the same announcement, Portnoy stated that the bands Scale the Summit and Bigelf would replace Pain of Salvation and Beardfish on the tour. This lineup change has put Bigelf on both the North American and European legs of the Progressive Nation 2009 tour. The tour's North American leg ran throughout July and August 2009. On March 26, 2009 it was announced that Dream Theater would take the Progressive Nation tour to Europe for the first time alongside Opeth, Bigelf and Unexpect. The tour ran throughout September and October 2009.